Take your first breaths underwater!! 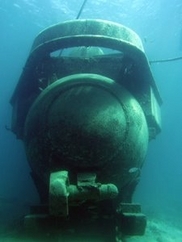 Experience the wonders of the underwater world! Our Discover Scuba Diving program takes you through the basics, where a Certified and Experienced PADI Scuba Instructor explains how to be safe and have the most fun possible! You'll be explained how to use the equipment and will also practice some essential scuba diving skills before we go on our adventure in the Caribbean Sea! After a short boat ride to the dive site, you can start to explore under the watchful eyes of our Experienced and Certified PADI Scuba Instructors. Our Discover Scuba Diving program takes place in Little Bay, at a shallow, protected reef, where you can expect to see a ton of fish, sponges, some corals...and if we're lucky, even an octopus! There are even a few sunken surprises and a 400 year old cannon from the oldest Dutch fort in the Caribbean!! Join us in St. Maarten for your scuba dive and see for yourself!! We offer the PADI Discover Scuba Diving program every afternoon. Check-In at the Dive Center in Philipsburg at 1:30pm. Guests must complete a Medical Questionnaire prior to scuba diving. Contact us for more information, to reserve a place or if you have any queries. Minimum age for the PADI Discover Scuba Diving is 10 years old. Download the medical questionnaire. 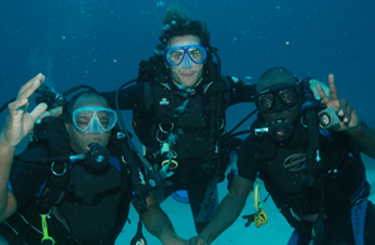 The PADI Discover Scuba Diving program is the first step in becoming a certified scuba diver. With your first scuba dive under your belt, why not achieve your full dive certification with the PADI Open Water Diver course? 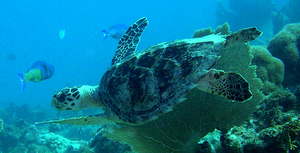 We look forward to diving with you and introducing you to our favorite dive sites around St Maarten/St Martin. We provide Round-Trip Transportation from Local Area Hotels. Contact us for details. A historic cannon from Fort Amsterdam, the oldest fort in the Caribbean, a sunken submarine, an angel fish, a shy octopus just some of the many things you might see on your Discover Scuba Dive in St Maarten.